Last year, I lost over 40lbs and started on a journey to get as fit as possible, I also became a certified personal trainer. My trainer took the photo of me below and added his crazy captions,lol. I can't believe how much my arms have developed. My goals for 2013 are to lose 3 inches off my waist, be able to squat and deadlift my body weight (and more), do a full split and hold a plank for 2 minutes or more. I also have the BIGGEST vanity goal of getting a bigger (seriously bigger, lol), rounder booty and firm well defined legs. No less than 3 training sessions per week with my trainer. No less than 2 stretching/yoga sessions per week. Stick to my nutrition plan which has not only helped me lose weight while allowing me to enjoy food without feeling hungry. So far, I have been sticking to my action plan, I have a friend who comes over and does the stretching routines with me, three times a week and I also go to my trainer three times a week plus on Sundays, I do a legs/glutes focused training session at home. I have also included a once a week Zumba workout as well, this is not only for exercise but for fun, plus in the summer in Barbados we have the Crop Over Festival and during this season we have these amazing Zumba Fitness Parties. 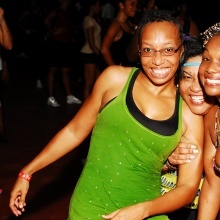 Check us out having fun at a Zumba Fitness Party last year in the photo below!